Amelia Earhart disappeared July 2, 1937, somewhere over the Pacific on a line between New Guinea and Honolulu. The first woman to attempt to fly around the globe, her apparent fall from the sky has fueled intrigue for more than eight decades. This past July, Rick Pettigrew, documentary producer and President of the Eugene-based Archaeology Legacy Institute, journeyed to Nikumaroro, a tiny, remote coral atoll in the western Pacific. His ocean trip to the uninhabited island included 50 other team members: crew, National Geographic Society investigators, aviation history researchers from the International Group for Historic Aircraft Recovery (TIGHAR), and four forensic dogs trained to sniff out human remains. Nikumaroro, it seems, may have afforded Amelia Earhart a flat stretch of coral reef, allowing for safe landing. It’s an island where she and her navigator could have established a survival camp while awaiting rescue. The evidence is compelling—and controversial: suppressed military reports of radio signals originating near Nikumaroro in July 1937; pieces of aluminum aircraft metal like that from Earhart’s plane; a woman’s shoe, cosmetic containers and particles of rouge; a sextant box like the one used by Earhart’s navigator; human bones consistent with the size and scale of Earhart’s frame discovered in 1940 but since lost. Enter archeologist Pettigrew with his video equipment. Enter the expedition’s sponsor, National Geographic, holding control over use of any new forensic evidence. Enter the quartet of dirt-sniffing dogs. In accordance with his agreement with National Geographic, Pettigrew could not videotape the dogs at work. He says that although the canines didn’t find any human bones, they alerted investigators to possible human remains. Dirt samples were collected for DNA analysis. What turn will the Earhart saga take when the DNA findings are revealed? For Pettigrew, that’s only a small part of the story he wants to tell. Civic Stadium was built in 1938, a place of massive timbers and a stunning view of Eugene’s east hills. Originally designed for high school football and baseball, the stadium later carved an identity as home to the Eugene Emeralds minor league baseball team. When the Emeralds moved to the University of Oregon sports complex in 2009, Civic forfeited its claim as one of the most distinctive minor league parks in America. 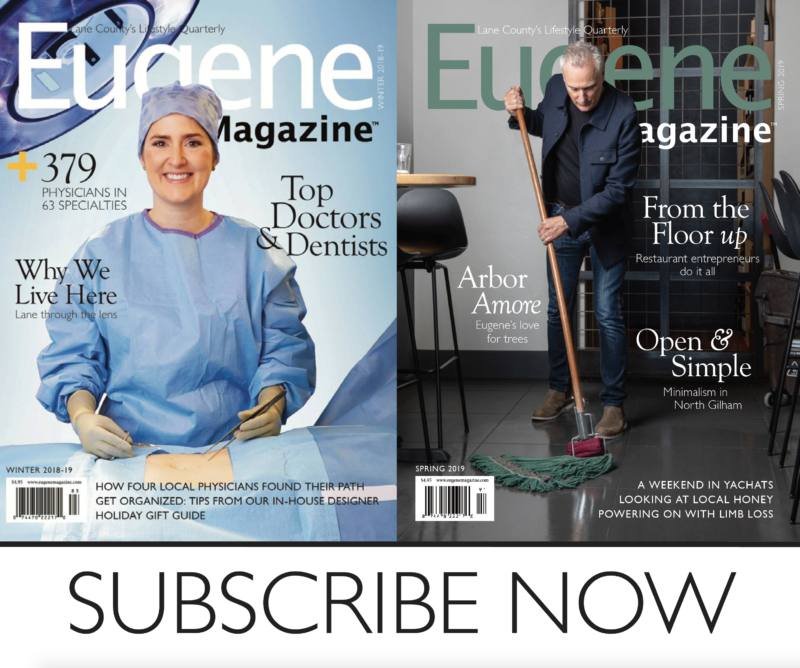 Then, in June 2015, the stadium burned to the ground, destroyed by teens playing with fire a mere two months after a grassroots community nonprofit, the Eugene Civic Alliance, purchased the stadium property with a dream to restore the site as a sports and recreation venue. Since the fire, the site has seemed silently resolute, almost ghostly. The blackened steel and timber have slowly disappeared. More recently, a simple mural appeared on an east-facing concrete wall. That’s the extent of any visible change. What’s gone largely unnoticed are the behind-the scenes efforts of the ECA to bring form and excitement back to the site. And now that excitement is about to take flight in the form of a multi-sport turf field for kids that will also showcase Lane United soccer events. The new facility will also include a 2,500-seat grandstand, twin outdoor multi-sport courts, and a 40,000-square-foot KIDSPORTS field house with space for middle school and high school basketball and volleyball courts. KIDSPORTS Director Bev Smith offers an insider’s perspective on how Civic Park will remedy the local shortage of gym and field space for kids. ECA Co-Executive Director Nancy Webber has a more pragmatic focus. Civic Park is poised to rise up like a phoenix from the ashes. Consider the equine family: horses, zebras, and donkeys. Horses often represent power and grace; zebras are prized for their striking appearance; and donkeys? Well, they’re typically the lowest limb on the family tree. They are, after all, sometimes known as asses—a rather unfair label considering they actually possess surprising intelligence and a host of other admirable traits. Just ask Nancy Willard, a former lawyer, special education teacher, and bully prevention expert. Willard recently established the local nonprofit Caring Place Donkey Sanctuary, operating on a shoestring. With her background, it’s no surprise she loves donkeys. Or that she’s a passionate advocate for the many positive qualities equus asinus brings to the table—especially when that table is a platform for treating childhood autism, trauma, and stress, or educating families about bullying. Willard calls her approach “the Way of the Donkey.” Her methods are based on the principles of informed trauma care and positive psychology. Those principles, she says, strongly carry over into the arena of donkey behavior. “When horses get stressed they tend to take flight,” Willard says. “When things get tough for donkeys, they stop and get grounded. That’s how they self-protect. They get focused, stand tall, think things through.” It’s an approach, she says, that’s well-suited to traumatized kids confronting stressful situations. Donkeys tend to seek out close relationships with other donkeys, in addition to enjoying bonding with humans. Both their approach to stress and their tendency to bond lend themselves to partnering kids with donkeys on obstacle courses. When a child-donkey pair confronts a challenge navigating course obstacles, a teachable moment arises for both partners. Over the past year, Willard’s vision for Caring Place has hurdled far beyond her financial wherewithal. Nine donkeys currently occupy the leased property just outside Eugene, their care and feeding occupying the biggest cost. But Willard sees past that to a future at a permanent home that includes obstacle courses of varying difficulty, overnight camp experiences, capacity for expanded donkey rescue services, and increased community outreach including more intensive special education programs in area schools. That too, says Willard, is the way of the donkey.